“Dialogue” and “Collaboration” with “Source Communities” – Wie weiter mit Humboldts Erbe? Ethnological museums and collections occupy a special position within the museum landscape. One of the reasons for this is that many contemporary descendants of the communities from which the collections originate seek feedback from these collections. In this respect, these institutions have a new, particular user group, the “source communities”[i]. 1. Clarenda Begay, representative of the Navajo Nation Museum, and Rainer Hatoum presenting adigitised collection of Navajo ceremonial songs. Photograph source: unknown, 10.10.2008, Window Rock, Arizona. These different projects focused on various aspects: discussion of the central terms “collaboration”, “dialogue”, and “cultural heritage of humanity”, the problem of clashing viewpoints, questions about “adequate” dialogue partners, and questions about balancing politically divergent views within “source communities”. In the database projects, in addition to the usual challenges of categorizing, linking, and defining incomplete / questionable / unclear museum documentation, the central problem that also emerged was in relation to unclear or outdated ethnic designations, fundamental with regard to collaborating with “source communities”. Moreover, issues connected to integrating indigenous forms of knowledge had to be addressed. In projects aimed at cooperation with multiple indigenous partners, again, questions about the frequent lack of appropriate institutional structures were an issue. The range of challenges also included different indigenous demands placed on certain objects. In recent projects, the need for further research has come to the forefront (key point: the digitisation of sources alone is often insufficient, for they must first be made accessible – sometimes necessitating the acquisition of key new skills). This not only gives rise to a new dimension of research, but also to the problem of bringing together different traditions of expertise. One core question has repeatedly arisen in my “collaboration”-oriented projects: “Who actually wants what from whom and for what reason?” When representatives of “source communities” approach museums from the “outside”, for example, to inspect or take stock of “their” collections, this question is not initially obvious – after all, such a request corresponds to the widespread self-conception of the museum as a “service institution”. However, this question can become critical if a “collaboration” is actively initiated by museums – as is the case with the majority of projects that I pursue. While, on the one hand, the ratio between “receptive” or “active” forms of “collaboration” may be taken as an indicator of a self-initiated means for reorienting the museum – and here I only speak of the one who actually initiates a “collaboration” – there is, on the other hand, also the challenge of not reproducing long-standing structural patterns that are often perceived as “colonial” or “Western”. For me, one project with the Navajo Nation[vii] was particularly instructive in this regard. As a representative – at least according to academic standards – of a successful, grant-funded project aimed at “consultations”, with a view toward the joint future management of a collection of ceremonial songs, I met with official representatives of the Navajo Nation who were responsible for projects not initiated by themselves. They made it clear that they saw my request for “consultation” as a petition for “collaboration”. Therefore, and as a way of “decolonizing” externally funded projects, they presupposed their active participation in the development and formulation of the project’s objectives that – above all – took their own interests into account. 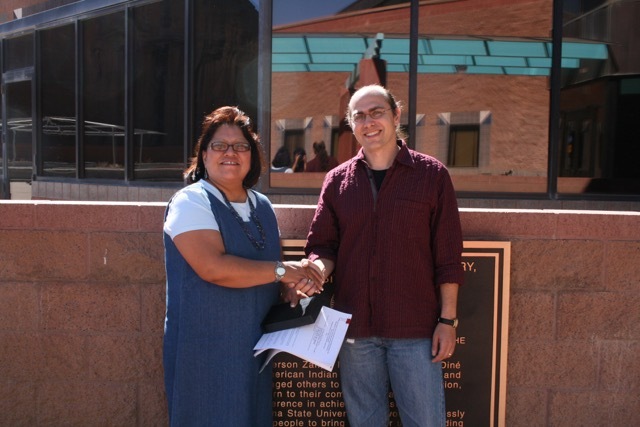 As a result, well over half of my three-year research project was devoted to the negotiation and approval of a jointly developed project concept by the Navajo Nation. Therefore, the negotiation and approval process was, in many ways, the main result of the project. For me personally, one point proved to be particularly critical: the central question of ownership over all forms of knowledge and representation that affect the Navajo Nation. The issue was that the Navajo Nation thereby made a claim that also extended to my field data and documents that were created through the project, as well as to questions of controlling my future presentations and publication activities that resulted from it. 2. Chief William Wasden Jr. (Kwakwaka’wakw) inaugurating work on the U’mista Database Project at the Ethnological Museum in Berlin, which commenced a series of collaborations that extend to the present day. Photo: Sharon Granger, 2007. Another point that is no less important in this context, for obvious reasons, is the question of whether collaborations are “time-limited/result-oriented” (e.g., the preparation of an exhibition) or “indefinite/open-ended” (e.g., a digital research network or the partnership-based management of a collection). The latter point, which to me seems particularly important with regard to fundamentally redesigning the future of the museum, can be significantly expanded. However, the challenges are also particularly significant: In addition to the general scarcity of human, financial, and temporal resources — which means that corresponding initiatives must be pursued via externally funded research projects (leading to a large number of other problems) — a clear institutional position is also beneficial here. I would like to conclude by suggesting the following: While it is both welcome and inevitable to critically examine different collection histories, and proactively address the skeletons in one’s closet, this cannot remain the sole perspective for the future. This insight led me – like many of my colleagues – to pursue an interest in elaborating the concept of a shared cultural heritage with “source communities”, which is shaped by “dialogue” and “collaboration”. Reflecting on my previous experience, however, I repeatedly asked myself to what extent the goal of creating such interactive spaces can be the measure of all things, and as to where are the limits? What to do if a request for collaboration – for example, regarding a certain “medicine bundle”[viii], to offer a specific case – is not met with appreciation? Should an exhibition and publication project still be carried out or not? What can be done if a dialogue partner only wants to accept his own claim in the process, or if a dialogue ends in a stalemate, i.e. in its initial position? Even if such questions can only ever be answered on a case-by-case and situational basis, they suggest that it is not enough to be open to “collaboration” and “dialogue”, or for that matter to merely seek them. My impression is that although the desire for dialogue on the part of museums is becoming increasingly popular, there are sometimes great uncertainties in the handling of specific, potentially sensitive topics – clearly for fear of “bad publicity” – which tend to lead to the neglect of such topics. Yet, these examples are particularly revealing with respect to reconciling different points of view. It therefore seems necessary to me that museums – even more now than before – should stake out clear positions of their own, a clear “mission statement” that will provide general guidance on this issue. I hope, therefore, that such reflection processes will lead to stronger and more active museum dedication to the already widespread commitment to “collaboration” with “source communities”. Since staff members of museums that have been established for many years can often only put this commitment into practice with considerable effort, due to general scarcity of resources, time, and infrastructural restrictions, one can only hope that this insight will also be reflected, both personally and financially, in dynamic museum projects that are currently unfolding – above all in the Humboldt Forum. In the future, it would be desirable if the question of “collaboration” with “source communities” could be better coordinated and pursued as a conscious museum policy. Rainer Hatoum studied Ethnology and Islamic Studies at the Free University of Berlin, receiving his Ph.D. in 2002 in Frankfurt. 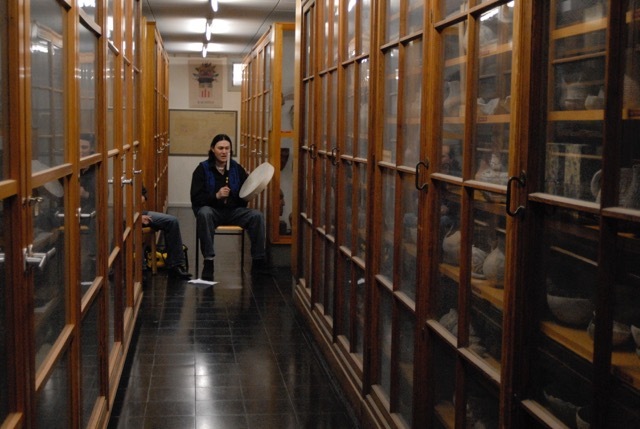 Between 2005 and 2012, he worked at the Ethnological Museum in Berlin as part of two three-year digitisation research projects that examined the potential of a long-term partnership with various North American Indian communities. These projects were carried out in cooperation with various departments at the Free University. After Hatoum first deciphered Franz Boas’ shorthand (2012/13), he also pursued the idea of collaborating with “source communities” in a number of other projects. [i] Even if the term “source communities” is in many respects problematic, as it insufficiently expresses the actual complexity of the issue, the term is retained here, as it is firmly grounded in key discussions on the topic. [ii] On the one hand, the “cultural sensitivity” of the collection arose from its conception as a potentially “dangerous” good, from a supernatural (i.e. non-human) source, whereas on the other hand, it also emerged through new collective claims by the “source community”, in this case the Navajo Nation (the official designation). Both observations question and challenge the claim of the archives holding this collection to recognise this collection as a German contribution to the preservation of humanity’s cultural heritage. [iii] z.B. Hatoum, Rainer 2010 Musealizing Dialogue. In Guzy, Lidia, Rainer Hatoum, Susan Kamel (Hg.). From Imperial Museum to Communication Centre? – On the New Role of Museums as Mediators between Science and Non-Western Societies. Würzburg, 121-136. 2015 Zeremoniallieder im Mediensog – Zur Problematik des ethnologischen Einsatzes und der Entfaltung von Medien anhand eines „kollaborativen“ Forschungsprojekts mit der Navajo Nation. In Bender, Cora und Martin Zillinger (eds.). (2015). Handbuch der Medienethnographie. Berlin 223-240. [iv] z.B. Hatoum, Rainer 2011 Digitization and Partnership – The Berlin Northwest Coast Collection and the Future of the “Non-European Other” in the Humboldt-Forum. In Blätter, Andrea und Sabine Lang (Hg.). EthnoScripts – Contemporary Native American Studies, Jahrgang 13/ Heft 2/ 2011. Hamburg, 155-173. 2014 – Self-Explanatory Objects? – The Berlin Boas Northwest Coast Collection in the Context of the Humboldt-Forum. In Förster, Larissa (Hg.). Transforming Knowledge Orders – Museums, Collections and Exhibitions. Paderborn, 107-134. [vi] z.B. Hatoum, Rainer 2016 “I wrote all my notes in shorthand. I hope that I will be able to read them”: A first glance into the treasure chest of Franz Boas’ shorthand writings. In Local Knowledge, Global Stage – Histories of Anthropology Annual, Vol. 10. University of Nebraska Press, 221-272. [vii] This is the official designation of the Navajo community, and the umbrella term of the political/bureaucratic bodies that represent it.